Why Choose Northern Patagonia Lodge? 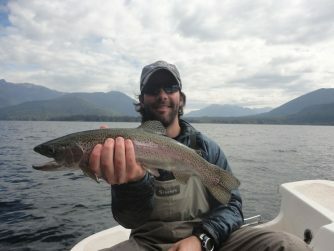 The fishing season at Chime lodge started in November with great conditions. We used mostly black and green sculpins and buggers. Since water levels were high, sinking lines and streamers on 6- and 7-weight rods were a must. And we hooked plenty of brown trout in 18- to 22-inch range. By January and February the weather turned hot, water levels dropped, and guests had great fishing—particularly early in the morning and late in the afternoons. We used mayfly and caddis dries, and nymphs such us copper Johns, pheasant tails, and princes. During hot afternoon we broke out the big flies and had success with fat alberts, spiders, and hoppers… to name a few. March was also a great month. It’s always nice to say goodbye to a season with fantastic fishing. At the beginning, smaller mayflies out-produced the foam terrestrials. Then we went back to streamers at the end of the month. All in all, it was a great season at Chime and we look forward to another great one soon. This January the fishing was excellent. Rivers are low due to a mild winter, and for now we’re fishing with floating lines and light rods. In the early mornings and evening hours we used mostly mayfly immitations to imitate summer great hatches. We also used small caddis hatches. The results included rainbow and brown trout between 17 “and 20” inches., as well. However at times, we were surprised by brown trout of 22” or 24” inches. At midday, we used attractor flies such as PMXs, Fat Alberts, Chernobyls, and Hoppers. inches. 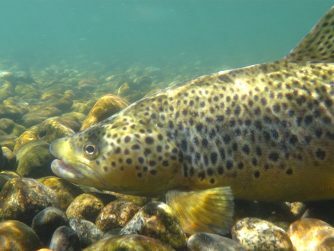 The middle Chimehuin, downstream from the town of Junin is full of brown trout. 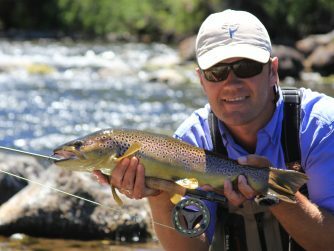 Collon Cura River: The best fishing is with minnow flies. We caught rainbow and brown trout in the 16” to 22” range. Malleo River: Best for expert anglers. We went with Andrei (a guest from Estonia) and he caught one big brown trout around 26 inches! Very difficult to catch! Alumine River: Water is currently very low. We used nymphs and dry-droppers. The catch included rainbows of around in the 15” to 19” range. In general the weather was great, very hot days. Likewise, the best fishing is early in the morning and late in the evening.